New York has long been a state of big ideas and the kind of can-do spirit that turns them into reality. Credit for this entrepreneurial attitude is due, in part, to a nationally-significant treasure: the Erie Canal. Built between 1817 and 1825, the original Erie Canal traversed 363 miles from Albany to Buffalo. It was the longest artificial waterway and the greatest public works project in North America. The canal put New York on the map as the Empire State—the leader in population, industry, and economic strength. It transformed New York City into the nation’s principal seaport and opened the interior of North America to settlement. Equally important, the Erie Canal became a central element forging our national identity. Built with a combination of vision, determination, ingenuity, and hard work, the Erie Canal solidified these central elements of our American character. Originally four feet deep and 40 feet wide, the Erie Canal cut through fields, forests, rocky cliffs, and swamps; crossed rivers on aqueducts; and overcame hills with 83 lift locks. The project engineers and contractors had little experience building canals, so this massive project served as the nation’s first practical school of civil engineering. Some laborers were Irish immigrants, but most were U.S.-born. For eight years of wet, heat, and cold, they felled trees and excavated, mostly by hand and animal power, mile after mile. They devised equipment to uproot trees and pull stumps and developed hydraulic cement that hardened under water. With hand drills and black powder they blasted rocks. 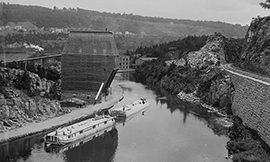 Their ingenuity and labor made the Erie Canal the engineering and construction triumph of its day. Canal packet boat passengers traveled in relative comfort from Albany to Buffalo in five days—not two weeks in crowded stagecoaches. Freight rates fell 90 percent compared to shipping by ox-drawn wagon. Freight boats carried Midwestern produce from Buffalo to Albany. Most continued on to New York City’s seaport, towed down the Hudson River in fleets behind steam tugboats. 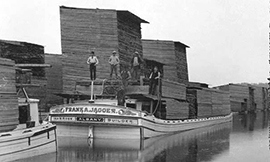 Mid-western farmers, loggers, miners, and manufacturers found new access to lucrative far-flung markets. Travel from Albany to Buffalo took two weeks by stagecoach in 1825. The Erie Canal shortened the journey to five days. The Erie Canal and a system of connecting waterways fulfilled DeWitt Clinton’s prophecy that New York would be America’s preeminent state, populated from border to border and generating wealth for itself and the nation. Soon New York City was the nation’s busiest port, most populous city, and foremost seat of commerce and finance. 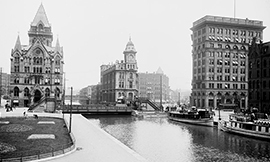 Immigrants knew they could find work there and in many new cities sprouting along the canal. As it opened the American interior to settlement, the canal brought a flow of people and new ideas. Social reform movements like abolitionism and women’s suffrage, Utopian communities, and various religious movements thrived in the canal corridor. The Erie Canal carried more westbound immigrants than any other trans-Appalachian canal. These newcomers infused the nation with different languages, customs, practices, and religions. The U.S. Congress recognized the Erie Canal’s significance to our nation by establishing the Erie Canalway National Heritage Corridor in 2000. The Corridor stretches 524 miles across the full expanse of upstate New York, from Buffalo to Albany and north along the Champlain Canal to Whitehall. It threads 234 diverse communities connected by a waterway that changed not just the landscape of our state, but also our nation and its history. 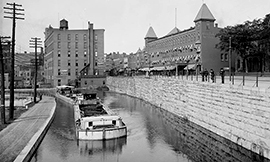 New York’s canal system has been in continuous operation since 1825, longer than any other constructed transportation system on the North American continent.